Although we reached the official end of the Atlantic Hurricane Season last Friday, its effects will be with us here in Florida well into 2019 due to Hurricane Michael’s destruction. The death toll is increasing, nearly 100,000 Panhandle residents are seeking housing through FEMA’s temporary shelter assistance program, and counties are scrambling to find money for recovery, as piles of debris remain untouched from the October 10 Cat 4 storm. If you haven’t come to see the damage for yourself you need to. I return to the Panhandle weekly and the scene unfortunately is pretty much the same. It may not be on the front page of newspapers anymore, but we’re going to keep it on the front page of ours. The Florida death toll was raised last week from 25 to 43, but will likely go higher, as huge piles of debris remain to be examined and removed. At least 8 deaths were because of the storm, including coastal storm surge, flooding, fallen trees, and collapsed buildings. Afterward, 5 people died while clearing trees. The rest of the deaths so far are indirect results of Michael – including 17 who died from illness or the inability of rescue workers to respond and sadly, 3 utility workers who died after being struck by an accused drunk driver, who left the scene. As of last week, 98,500 people were registered with FEMA, which has awarded nearly $225 million in assistance through three programs for people whose insurance (if they have it) or other disaster assistance, can’t meet their needs. Money is provided for temporary rental housing or hotels, home repair, and home replacement. The FEMA hotel program is housing 766 families. 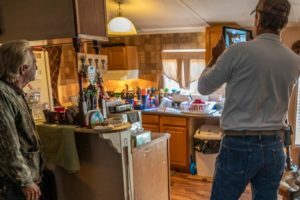 But there’s a shortage of rentals available in the Panhandle, so money is also available for FEMA direct housing services through manufactured homes and multi-family lease agreements. FEMA has staged about 2,500 mobile homes and trailers in the region for a planned period of 18 months. Money is also available to repair and replace essential household items, vehicles or other transportation-related costs, and moving and storage assistance, for those not eligible for loans. FEMA is holding “scoping meetings” to seek community input and assessment of what’s needed to address what many are saying is a lack of coordination in pursuing a speedy recovery. The agency is working with local and state officials to assess housing inventory data to develop a strategy that puts a roof over everyone’s head long-term. This includes exploring potential housing partnerships and reviewing previously unfunded Florida Housing Finance Corporation Tax Credit applicants. Bay County has created its own recovery task force. As of last Friday, 130,000 insurance claims had been filed, with estimated insured losses of $4 billion. 63% of claims are closed and of those, 84% were paid. So far, five counties have topped 5,000 claims, with Bay County, the most populous and hardest hit, accounting for 60% of all claims. The National Flood Insurance Program has paid out $44 million to policyholders. Catastrophe modeling firms estimate total claims cost at $5 billion to $10 billion, including areas outside of Florida. But all these figures cover only those people who had insurance. 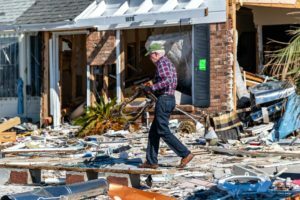 Official damage totals are still weeks away, as the state Department of Emergency Management (DEM) noted that it is very early in the recovery process. Many of the 13 impacted counties don’t have reserve funds for cleanup and recovery. The Bay County Commission has floated a $50 million bond to pay for debris removal and infrastructure repair. Although FEMA is expected to reimburse at least some of those costs, counties are still waiting for repayment for unexpected Hurricane Irma expenses. Other, more rural counties that don’t have the bonding capacity, are appealing to the state for a hand-up to bridge the time it will take until federal disaster funds physically arrive. Calhoun County, adjacent to Bay County and one of the state’s poorest, doesn’t have money to front recovery efforts. Its predominant source of tax revenue – timber – was flattened by the hurricane’s 155 mph winds. The county has asked DEM to advance the cash needed to pay cleanup bills but DEM says doing so would violate state law requiring all federal grants be acquired through formal contracts. You can read more here about the fine line between government bureaucracy and fiscal accountability. It’s impacting Michael and Hurricane Irma recovery efforts from last year, too. High-ranking Florida leaders are working to find a czar to coordinate different pots of money and to achieve the touted “speedy recovery.” In a meeting last week in Gulf County, I heard a local official estimate a 30% loss of property tax valuation from the storm. Its largest town, Port St. Joe, lost half of its water and sewer customers. When you take into account closed gas stations and other businesses, the loss of sales tax and other state tax sharing revenue is expected to account for a 50% cumulative tax loss for Gulf County for a certain amount of time. Just how much time does the Panhandle have? 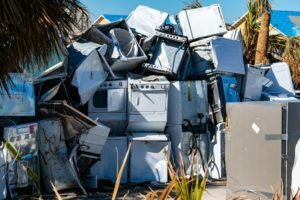 The Florida Legislature is expected to review the looming costs, as well as the response and preparedness associated with Hurricane Michael. 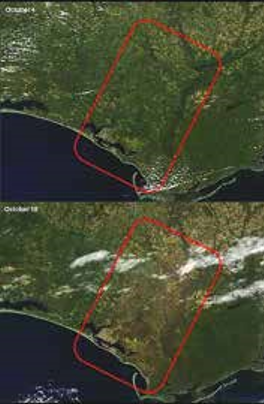 A large number of homes and other buildings in the Florida Panhandle were built before 1995, when Florida’s tougher post-Hurricane Andrew building code was established. 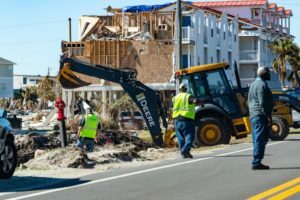 The newer Florida Building Code (FBC) requires structures to be built to withstand winds of 110 mph, so rebuilt homes in the Panhandle at least will have to be to the newer standard (many were built to a 75 mph standard). As we heard from field adjusters during a recent Florida Insurance Roundup podcast, newer homes built to newer code, still had shingles flying off “like Post-It notes off a pad” during Michael. Discussions to require the much tougher Miami-Dade building code (winds in excess of 170 mph) in the Panhandle appear to be a non-starter for now. I talked with three senators and a few more house members and they just don’t see being able to push the higher codes in the Panhandle. Part of the discussion is cost. Prisons are the largest employers in several of the counties impacted and the median income for correctional officers in the area is $34,000. Most don’t make more than $45,000. Those who had property insurance with Ordinance and Law coverage for increased costs required by tougher codes presumably should be fine. But what of those who didn’t? I believe many rebuilt structures, especially along the coast, will be rebuilt by investors with lots of money who have customers who won’t care how much this resiliency effort matters. And will the cost of insurance coverage itself go up? One agent I talked with said no – that homes rebuilt to the FBC will be eligible for substantial mitigation credits – and that insurance costs should actually go down. In the end, we are only as good as the building code enforcement officials in the area present during reconstruction.